WARMINSTER TWP., Pa. (WPVI) -- Police have arrested a teenager in connection to a series of tire slashings in Warminster Township, Bucks County. 19-year-old Collin Francis Jones of Southampton has been charged with Criminal Mischief, Possession of an Instrument of Crime, Disorderly Conduct, and Criminal Trespass. Warminster police say the tires were slashed on a total of 59 vehicles along Street Road, including 27 at Lafferty Chevrolet dealership. One building was also damaged. The total damages were estimated to be approximately $37,000. Surveillance video from Lafferty Chevrolet shows what appears to be one person meticulously going between their fleet of trucks. 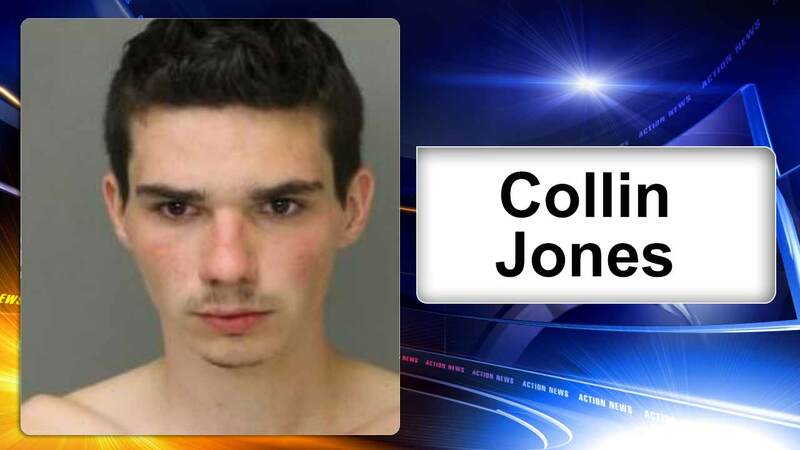 It turns out, Jones was already in custody in the Bucks County Correctional Facility for a separate incident. Police say on Tuesday he got involved in a fight with a juvenile male at the Saxony Manner Apartments on York Road in Warminster Township. During the course of the altercation, police say Jones produced two knives and stabbed the juvenile on his arm. In this case, Jones was charged with Aggravated Assault, Terroristic Threats, Possession of an Instrument of Crime, Simple Assault, and summary Harassment. Jones was remanded to BCCF in lieu of $25,000 for the assault charges and an additional complaint was filed relating to the criminal mischief. Arraignment on those charges is pending.